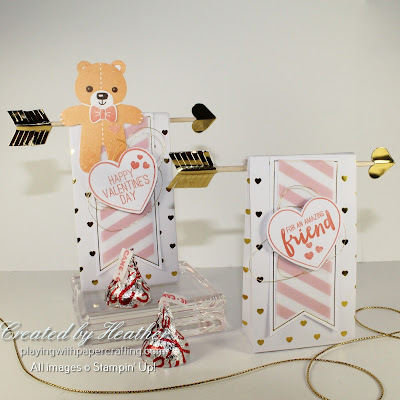 I had a good-sized order come in on Friday evening which needed Thank You cards and I had seen a thank you card made with the Occasions stamp set called Love Sparkles on Pinterest a week or two ago. I filed away the info that Love Sparkles has a Thank You sentiment in the crafting recesses of my mind and it popped to the surface as I considered what stamp set to use with this batch. 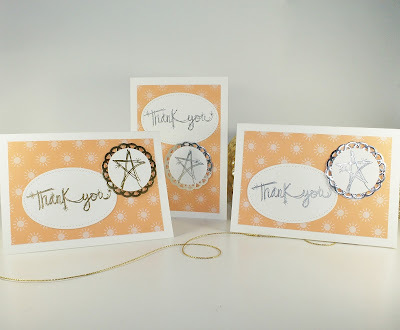 Both the sentiment and the stars were embossed with either Silver or Gold Stampin' Emboss Powder, and the star and the Metallic Foil Doily that backs it were the appropriate matching metal colour. The Stitched Shape Framelits (which are again available to order) were used to die cut the oval shape around the Thank You sentiment. I used the 1 3/8" Circle Punch to punch out the star and glued it on the metallic foil doily. Then it was added to the card front with Dimensionals. The card base itself is a Notecard, 3 1/2" x 5", in Whisper White. These really cute little treat bags are adorable and you get 24 in the pack so I can do at least 4 per child, depending on how many sign up. Everything is already cut and ready to go as well so it will be easy to prep for the class! 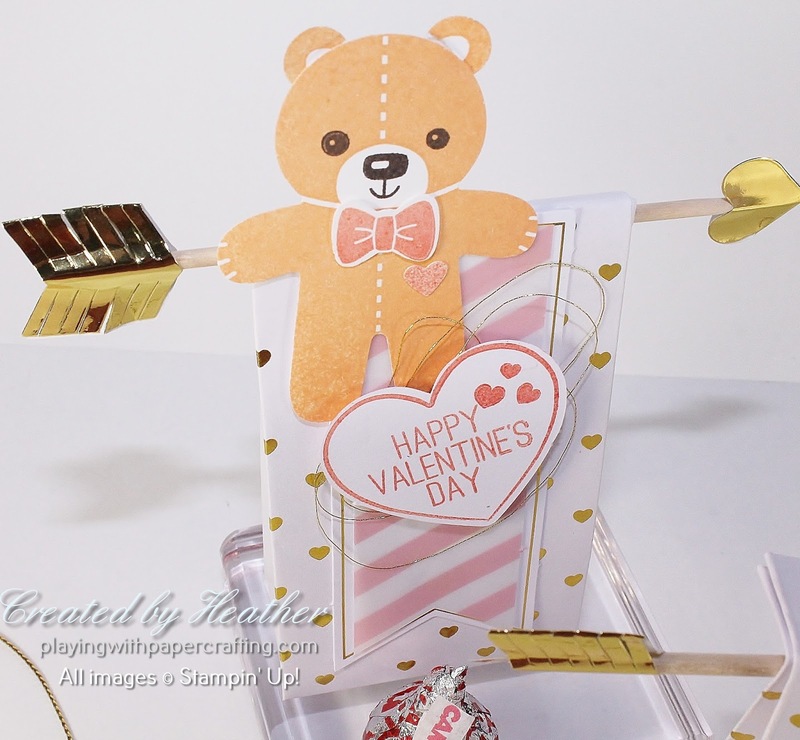 The teddy bear you see does not come in the paper Pumpkin, I made him using the Cookie Cutter Christmas stamp set which has been held over until the end of May so you can still purchase it. He is stamped in Peek-a-Boo Peach with a bow tie and heart of Calypso Coral! He is then punched out with the Cookie Cutter Builder Punch. Each bag will hold 2 or three candy kisses and then can be fastened shut with a star heart, although I hear that the heart may need a boost in the adhesive department to keep them shut! If you are interested in this class, you can read more about it here.